The driver who caused your car accident may have had something entirely different from driving on their mind at the time of the wreck. We’ve all seen examples of distracted driving: cell phone use behind the wheel, texting while driving, turning to deal with kids, applying makeup or shaving, fiddling with the radio, etc. Distracted driving is multitasking at its potentially deadly worst. When a car accident has been caused by a distracted driver, those who have been injured or lost a loved one deserve swift and sure compensation for their losses. 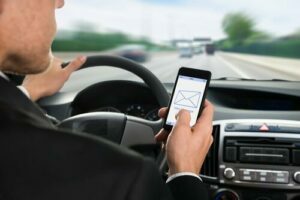 In Baton Rouge and all of Louisiana, the car accident attorneys at Babcock Trial Lawyers helps victims of distracted driving car accidents set things right financially. Our personal injury lawyer Baton Rouge will work to obtain fair and appropriate insurance payments for distracted driving victims’ medical expenses, lost income, property damage, pain and suffering and more. If you have been hit from behind in a car accident, you are not alone. Rear-end collisions are the most common type of car accident. They are also the most common cause of whiplash, a painful and potentially disabling neck, and back injury. A head-on collision is the type of car accident most likely to result in death. Head-on collisions account for about 2 percent of car accidents but cause about 10 percent of all motor vehicle fatalities. A rollover accident, in which a car tips over onto its side or roof, is a dangerous car crash. Rollover accidents have a higher fatality rate than other car accidents. If you or a loved one has survived a rollover, your injuries are likely to be serious, but you may be lucky to be alive. It should come as no surprise that intersections are the scenes of many car accidents. Multiple streams of traffic cross and turn in front of each other. When drivers don’t pay attention at intersections, crashes are often the result. As you may expect, the increased speeds allowed on Louisiana interstates and highways result in more destructive crashes when car accidents occur. When high-speed highway accidents happen in heavy traffic, multiple vehicles may become involved, resulting in pileups that damage many cars and injure or kill multiple people. Baton Rouge auto accidents can often lead to scars, lacerations or disfigurement. Sometimes those accidents come in the form of auto accidents, other times it may be from a dog or animal bite. We are confident that we can make a difference for you. In fact, having an experienced accident lawyer on your side may be the number one factor in your obtaining any recovery at all. That said, if you don’t obtain a financial recovery, you will pay no attorney’s fee or costs. And if you are not satisfied with how your case is going, we will return your case file to you within 30 days of being hired as part of our 100% Satisfaction Guarantee with no attorney’s fee or costs owed to us whatsoever. Babcock Trial Lawyers car wreck attorneys Stephen Babcock and Chase Tettleton have been named among the Top 10 Personal Injury Lawyers in Louisiana and are members of the Multi-Million Dollar Advocates Forum, trial lawyers who have won million and multi-million dollar injury cases. Babcock Trial Lawyers wants clients to be fully assured of the representation the firm provides. Contact Babcock Trial Lawyers today for a free case evaluation. We’ll outline your legal options and our 100% Satisfaction Guarantee: No fee until we recover a monetary award for you and, if you are not 100% satisfied, terminate us within 30 days and you won’t owe us anything at all. Nothing. No costs. No fees. No kidding. Nothing. When I needed a personal injury attorney after my car accident, I called Stephen Babcock and his firm represented me and got me a great settlement from my car wreck. 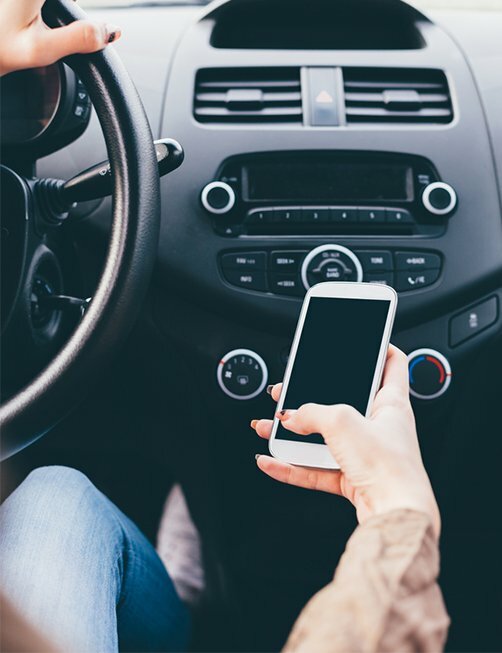 Drivers continue to engage in distracting behavior and cause accidents in Louisiana despite laws prohibiting texting while driving by all drivers and cell phone use by minors and new drivers. They do it despite news reports of horrific injuries and death in distracted driving accidents, and despite public awareness campaigns. These reckless drivers also continue to cause accidents as it becomes easier to prove distracted driving is the cause of the crashes they are involved in. Babcock Trial Lawyers looks for certain evidence to bolster your case. which may indicate that distracted driving was suspected. from the driver, passengers or other witnesses. which may indicate use at the time of the crash. which may contain incriminating statements about the accident. showing food or drink purchases just before the crash, which may be evidence of eating or drinking while driving. Food and drink spills and other evidence among debris in the wrecked car might exist, as well. such as lack of skid marks or short, straight skid marks indicating a distracted driver did not brake or swerve to avoid a collision. downloaded from the car’s “black box.” In more and more cars, EDRs record such data as engine speed, changes in speed, use of brakes, steering trajectory, and more about the operation of a car on the road. Every car accident case is unique, but through the numerous distracted driving cases we have handled, Babcock Trial Lawyers knows what evidence to look for as we build your case. Once convincing evidence is in hand, we can press insurers for appropriate payment. It is important to engage Babcock Trial Lawyers as soon as possible after a car accident to ensure that evidence is not degraded, destroyed or lost. Access to the other driver’s wrecked car, and in particular an EDR if available, as well as cell phone records or social media accounts, typically require a court order. What Can You Recover After a Distracted Driving Accident in Louisiana? Compensation for a car accident claim will come from either the other driver’s auto liability insurance or your own uninsured motorist insurance. Unfortunately insurance companies profit by paying less in claims than they take in as premiums. Therefore, insurance adjustors work to settle as fast as possible for as little as possible. This is why you should never accept a settlement offer from an insurance company without first speaking to an experienced car accident lawyer. It is easy for medical expenses, lost income and other damages suffered in a car accident to exceed the limits of minimum insurance coverage. In many cases there is no coverage beyond the minimum, and sometimes we find the responsible driver is uninsured. In such cases, we must turn to other policies, such as your own underinsured / uninsured motorist (UIM/UM) coverage, to obtain compensation you are due. An additional point to understand is that Louisiana is a “pure comparative negligence state.” This means the amount of compensation you recover in a claim could be reduced if you bear any fault for the accident. Your role would be expressed as a percentage (10%, 30%, 40%, etc.) and your overall compensation as awarded by a jury or agreed to in a settlement, would be reduced by that amount. However, even if you are at fault, you can still recover some amount. Regardless, an insurance policy is a contract. Louisiana law, when properly understood and applied by an experienced car accident attorney, can be used to compel insurers to pay to the full extent of the policies they have issued. Babcock Trial Lawyers would identify all insurance policies applicable to your claim and press insurers to pay the full amount provided in that coverage. Meanwhile, we would work to mitigate any fault assigned to you, including vigorously challenging any attempt by the insurance company to falsely blame you for the accident. We will fight for you. In court or in the conference room, we stand fast for the principle of doing what’s right by our clients.